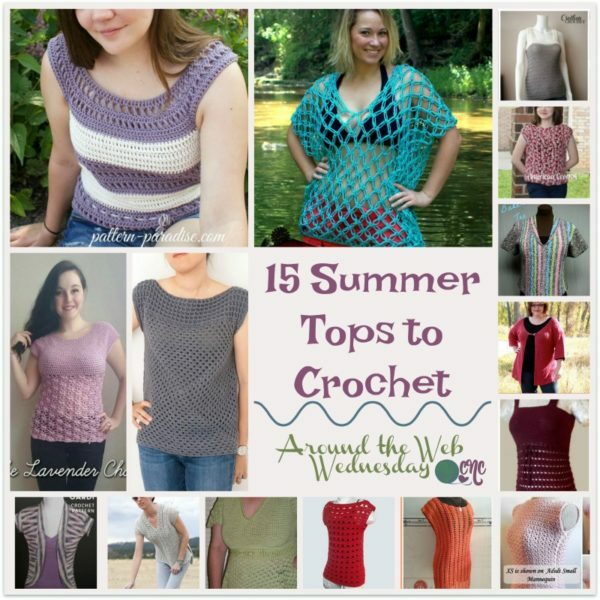 In the second Around the Web Wednesday we have a roundup of 15 summer tops that you can crochet for yourself, and some can also be modified for young children as well. 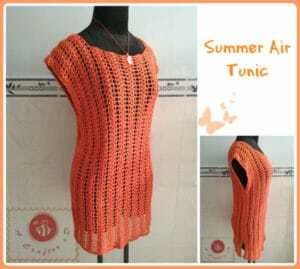 Summer is here, but that doesn’t mean that it’s too late to crochet a nice summer top for yourself. Depending on how much time you have, you can easily whip one up in a weekend or two, as many of these don’t require much time. 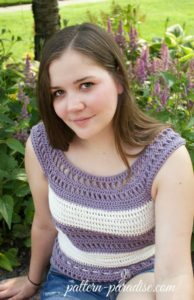 Many of these crocheted tops are available in multiple sizes, while some also include basic instructions on how to customize for any size that you need. So why not have a quick browse and pick out a few for yourself and a few for your friends and family. Among the collection you’ll find a beach cover, stylish tanks that you can wear with fancy skirts, as well as every-day tanks for jeans and shorts. Here is a beauty you don’t want to miss! I just love the solid stitch at the top, followed by a beautiful lace that you’ll love to show off in the hot summer months. Here is another top with a nice solid top and a lacy bottom. And this one also has a nicely shaped bottom that you’ll enjoy wearing with fancy summer skirts. This summer top is worked in two rectangles that are joined together at the seams. Thus, it makes for the perfect beginner top. And it’s available in multiple sizes too. What’s not to love about this beautifully striped summer top! It’s available in multiple sizes, crocheted in a cotton, and it’s machine washable! So why not give this one a go? I love the vertical columns in this design. It’s a beautiful top that you’ll enjoy wearing with skirts, or as a fancy beach cover-up! If you love Grannies, then this one is for you! It looks great in one color, but the granny patterns are always fun in bright and cheerful colors too, if you like. And the pattern comes with lots of photos and a few videos to help you along the way. 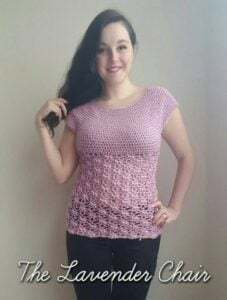 Available in multiple sizes, this summer top pattern is worked in a solid stitch at the top and in a somewhat lacy stitch at the bottom. It has a nice flare allowing it to conform to the body. And you have to option to stop the length at a summer top, or continue for a cute summer dress. I don’t know what it is about this top, but it’s one of my favorites. Perhaps it’s the pretty X-stitch, the stripes or maybe it’s just the pretty summery colors! The beauty of crochet is that you can basically do whatever you like when it comes to color. And this pattern is the perfect example of how each color combo gives you an entirely new look! The free pattern is available in XS only, however, you can purchase other sizes if you like. 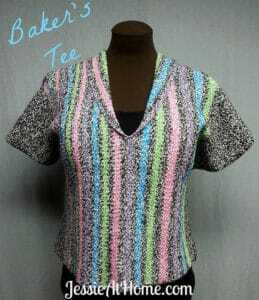 This cute summer top pattern is given in one size only. However, it provides you with a stitch multiple making it easy to crochet this to any width and length as you like. This is a directional with basic instructions and links on how to complete this styling cover up. 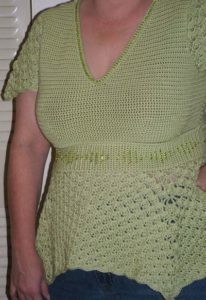 The top can be crocheted in any size from children and up. Believe it or not, but this beautiful t-shirt is crocheted up in two rectangles that are joined together. It’s a bit different than what I’ve seen so far, but I totally LOVE the style, and the simplicity! 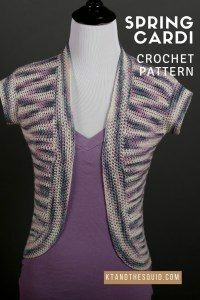 Pattern is available in several sizes with instructions for a custom fit. This one is perfect for the cooler summer days and evenings. It is crocheted in a blend of natural fibers, and is available in multiple sizes. Spring, summer, fall or winter… this cardi is the perfect top to go with just about anything in your closet. Wear it in the summer as a cover over a tee, or in the cooler weather to help keep the chills at bay. The pattern is available in multiple sizes. Here is another pattern that is worked in two rectangles and then joined at the seams. The pattern is available in multiple sizes. Plus, it also gives you a stitch count, so you can make it to any size you like from child to adult. If you enjoyed this, you might also enjoy a browse over at CPB for more summer tops.